Control rods are usually used in control rod assemblies (typically 20 rods for a commercial PWR assembly) and inserted into guide tubes within a fuel element. A control rod is removed from or inserted into the central core of a nuclear reactor in order to increase or decrease the neutron flux, which describes the number of neutrons that split further uranium atoms. This in turn affects the thermal power, the amount of steam produced and hence the electricity generated. Control rods often stand vertically within the core. In PWRs they are inserted from above, with the control rod drive mechanisms mounted on the reactor pressure vessel head. In BWRs, due to the necessity of a steam dryer above the core, this design requires insertion of the control rods from beneath. The control rods are partially removed from the core to allow a chain reaction to occur. The number of control rods inserted and the distance to which they are inserted can be varied to control activity. Typical shutdown time for modern reactors such as the European Pressurized Reactor or Advanced CANDU reactor is 2 seconds for 90% reduction, limited by decay heat. Chemical elements with a sufficiently high neutron capture cross-section include silver, indium and cadmium. Other elements candidates include boron, cobalt, hafnium, samarium, europium, gadolinium, terbium, dysprosium, holmium, erbium, thulium, ytterbium and lutetium. Alloys or compounds may also be used, such as high-boron steel, silver-indium-cadmium alloy, boron carbide, zirconium diboride, titanium diboride, hafnium diboride, gadolinium nitrate, gadolinium titanate and dysprosium titanate. The burn up of the absorbing isotopes is another limiting lifespan factor. They may be reduced by capturing long isotope rows of the same element or by not using neutron absorbers for trimming. For example, in pebble bed reactors or in possible new type 7lithium-moderated and -cooled reactors that use fuel and absorber pebbles. Some rare earth elements are excellent neutron absorbers and are less rare than silver (reserves of about 500,000t). For example, ytterbium (reserves about 1 M tons) and yttrium, 400 times more common, with middle capturing values, can be found and used together without separation inside minerals like xenotime (Yb) (Yb0.40Y0.27Lu0.12Er0.12Dy0.05Tm0.04Ho0.01)PO4, or keiviite (Yb) (Yb1.43Lu0.23Er0.17Tm0.08Y0.05Dy0.03Ho0.02)2Si2O7, lowering the cost. Xenon is also a strong neutron absorber as a gas and can be used for controlling and (emergency) stopping of helium-cooled reactors, but does not function in cases of pressure loss, or as a burning protection gas together with argon around the vessel part especially in case of core catching reactors or if filled with sodium or lithium. Fission-produced xenon can be used after waiting for caesium to precipitate, when practically no radioactivity is left. Cobalt-59 is also used as an absorber for winning of cobalt-60 for x-ray production. Control rods can also be constructed as thick turnable rods with a tungsten reflector and absorber side turned to stop by a spring in less than 1 second. Silver-indium-cadmium alloys, generally 80% Ag, 15% In and 5% Cd, are a common control rod material for pressurized water reactors. The somewhat different energy absorption regions of the materials make the alloy an excellent neutron absorber. It has good mechanical strength and can be easily fabricated. It must be encased in stainless steel to prevent corrosion in hot water. Also, although indium is less rare than silver, it is more expensive. Boron is another common neutron absorber. Due to the different cross sections of 10B and 11B, materials containing boron enriched in 10B by isotopic separation are frequently used. The wide absorption spectrum of boron also makes it suitable as a neutron shield. The mechanical properties of boron in its elementary form are unsuitable, and therefore alloys or compounds have to be used instead. Common choices are high-boron steel and boron carbide. The latter is used as a control rod material in both PWRs and BWRs. 10B/11B separation is done commercially with gas centrifuges over BF3, but can also be done over BH3 from borane production or directly with an energy optimized melting centrifuge, using the heat of freshly separated boron for preheating. Hafnium has excellent properties for reactors using water for both moderation and cooling. It has good mechanical strength, can be easily fabricated, and is resistant to corrosion in hot water. Hafnium can be alloyed with other elements, e.g. with tin and oxygen to increase tensile and creep strength, with iron, chromium and niobium for corrosion resistance, and with molybdenum for wear resistance, hardness and machineability. Such alloys are designated as Hafaloy, Hafaloy-M, Hafaloy-N, and Hafaloy-NM. The high cost and low availability of hafnium limit its use in civilian reactors, although it is used in some US Navy reactors. Hafnium carbide can also be used as an insoluble material with a high melting point of 3890 °C and density higher than that of uranium dioxide for sinking unmelted through corium. Dysprosium titanate was undergoing evaluation for pressurized water control rods. Dysprosium titanate is a promising replacement for Ag-In-Cd alloys because it has a much higher melting point, does not tend to react with cladding materials, is easy to produce, does not produce radioactive waste, does not swell and does not outgas. It was developed in Russia and is recommended by some for VVER and RBMK reactors. A disadvantage is less titanium and oxide absorption, that other neutron absorbing elements do not react with the already high-melting point cladding materials and that just using the unseparated content with dysprosium inside of minerals like Keiviit Yb inside chromium, SiC or c11B15N tubes deliver superior price and absorption without swelling and outgassing. Hafnium diboride is another such material. It can be used alone or in a sintered mixture of hafnium and boron carbide powders. Many other compounds of rare earth elements can be used, such as samarium with boron-like europium and samarium boride, which is already used in the colour industry. Less absorptive compounds of boron similar to titanium, but inexpensive, such as molybdenum as Mo2B5 Since they all swell with boron, in practice other compounds are better, such as carbides etc. or compounds with two or more neutron absorber elements together. It is important that tungsten, and probably also other elements like tantalum, have much the same high capture qualities as hafnium, but with the opposite effect. This is not explainable by neutron reflection alone. An obvious explanation is resonance gamma rays increasing the fission and breeding ratio versus causing more capture of uranium etc. over metastable conditions like for isotope 235mU, which offers a half time of about 26 min. Other means of controlling reactivity include (for PWR) a soluble neutron absorber (boric acid) added to the reactor coolant, allowing the complete extraction of the control rods during stationary power operation, ensuring an even power and flux distribution over the entire core. This chemical shim, along with the use of burnable neutron poisons within the fuel pellets, is used to assist regulation of the core's long term reactivity, while the control rods are used for rapid reactor power changes (e.g. shutdown and start up). Operators of BWRs use the coolant flow through the core to control reactivity by varying the speed of the reactor recirculation pumps (an increase in coolant flow through the core improves the removal of steam bubbles, thus increasing the density of the coolant/moderator, increasing power). In most reactor designs, as a safety measure, control rods are attached to the lifting machinery by electromagnets, rather than direct mechanical linkage. This means that in the event of power failure, or if manually invoked due to failure of the lifting machinery, the control rods fall automatically, under gravity, all the way into the pile to stop the reaction. A notable exception to this fail-safe mode of operation is the BWR, which requires hydraulic insertion in the event of an emergency shut-down, using water from a special tank under high pressure. Quickly shutting down a reactor in this way is called scramming. Mismanagement or control rod failure has often been the cause for nuclear accidents, including the SL-1 explosion and the Chernobyl disaster. Homogeneous neutron absorbers have often been used to manage criticality accidents which involve aqueous solutions of fissile metals. In several such accidents, either borax (sodium borate) or a cadmium compound has been added to the system. The cadmium can be added as a metal to nitric acid solutions of fissile material; the corrosion of the cadmium in the acid will then generate cadmium nitrate in situ. 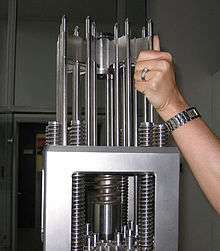 In carbon dioxide-cooled reactors such as the AGR, if the solid control rods fail to arrest the nuclear reaction, nitrogen gas can be injected into the primary coolant cycle. This is because nitrogen has a larger absorption cross-section for neutrons than carbon or oxygen; hence, the core then becomes less reactive. As the neutron energy increases, the neutron cross section of most isotopes decreases. The boron isotope 10B is responsible for the majority of the neutron absorption. Boron-containing materials can be used as neutron shields to reduce the activation of objects close to a reactor core. ↑ Anthony Monterrosa; Anagha Iyengar; Alan Huynh; Chanddeep Madaan (2012). "Boron Use and Control in PWRs and FHRs" (PDF). ↑ A. V. Voloshin, Ya. A. Pakhomovsky, F. N. Tyusheva: Keiviite Yb2Si2O7, A new ytterbium silicate from amazonitic pegmatites of the Kola Peninsula. In: Mineralog. Zhurnal. 1983, 5-5, S. 94–99 (Abstract in American Mineralogist, S. 1191; PDF; 853 kB). ↑ "CONTROL MATERIALS". web.mit.edu. Retrieved 2015-06-02. ↑ "Control Materials". Web.mit.edu. Retrieved 2010-08-14. ↑ "Hafnium alloys as neutron absorbers". Free Patents Online. Retrieved September 25, 2008. ↑ "Dysprosium (Z=66)". Everything-Science.com web forum. Retrieved September 25, 2008. ↑ "Method for making neutron absorber material". Free Patents Online. Retrieved September 25, 2008. ↑ "Infrarotabsorbierende Druckfarben - Dokument DE102008049595A1". Patent-de.com. 2008-09-30. Retrieved 2014-04-22. ↑ "Sigma Plots". Nndc.bnl.gov. Retrieved 2014-04-22. ↑ "Sigma Periodic Table Browse". Nndc.bnl.gov. 2007-01-25. Retrieved 2014-04-22. ↑ "Enriched boric acid for pressurized water reactors" (PDF). EaglePicher Corporation. Archived from the original (PDF) on November 29, 2007. Retrieved September 25, 2008.